Recorded at Sound Techniques, Basing Street and Air studios, May 1971. Produced by Sandy Denny - Richard Thompson and John Wood. Thompson (vocals, acoustic & electric guitars, accordion) / Trevor Lucas (acoustic, electric & 12-string guitars, background vocals) / Jerry Donahue (electric guitar) / Buddy Emmons (pedal steel guitar) / Barry Dransfield (violin, background vocals) / Ian Whiteman (piano, flute organ) / Pat Donaldson (bass) / Gerry Conway, Roger Powell (drums) / Royston Woods, Robin Dransfield (background vocals). 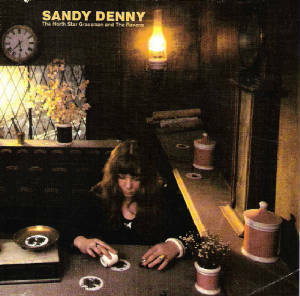 Following her celebrated first stint with Fairport Convention and the dissolution of the short-lived folk rock super-group Fotheringay, Denny recorded a run of fine solo albums during the '70s. The Northstar Grassman and the Ravens, the first of those solo albums, was co-produced and engineered by the ever-reliable John Wood. It's business as usual as far as participating musicians go. Denny's former Fotheringay companions are present, and ex-Fairport guitar prodigy Richard Thompson is all over the album. Freed of the compromises of a democratic group, Denny is able to concentrate on her own material. However, she also finds room for a fine arrangement of the traditional "Blackwaterside," a dip into her beloved rock & roll on "Let's Jump the Broomstick," and the obligatory Dylan cover, "Down In The Flood." But it is the quality of the original material that marks this album. Finest are the plaintive "Next Time Around," with a delicate string arrangement by Harry Robinson, and the moody "Late November." "John the Gun" is vintage folk rock, featuring fiddler Barry Dransfield, who is joined on stirring backing vocals by brother Robin and by Royston Wood (ex-Young Tradition). And the tale that hopes they'll never leave.